A long paddle out in the waters is a great way to unwind. But that’s only before your arms give in to the continuous paddling. What if we said you don’t have to do all the hard work alone? And no, we’re not talking about taking turns with a friend! Invest in a kayak sail and you get to relax and enjoy the scenery while it does the work for you. A kayak sail works pretty much like a traditional sail found on boats. The sail is designed to harness the wind’s power to give your kayak that extra push. If this idea sounds appealing to you, then read on as we give you a few pointers on what to look for when purchasing the right kayak sail for you. Hopefully, after going through our buyer’s guide and list of recommendations, you’ll realize it’s exactly what you’re looking for. Below we’ll list a few advantages associated with having a sail on a kayak and how it’s likely to create a new & pleasurable kayaking experience. You’ll agree that any unit that’s designed to make your paddling easier is worth considering. Paddling for hours on end is likely to cause arm & muscle fatigue after a while. So why not invest in a kayak and allow the wind to help you reach your intended destination? Thinking of going fishing? Having a sail on your kayak means you’ll have unrestricted movement. Your arms are freed up so that you can focus on the task at hand—fishing. Have you been dreaming of learning how to sail but fear capsizing? Then a kayak sail might very well be the answer to your problem. The huge sail boats can be a little intimidating. Given the small size of a kayak, it makes it much easier and safer to practice sailing before you move on to a larger sail boat. Most kayak sails are designed to disassemble into small units. This in turn makes it easy for them to be stowed away in the stern. Also, the compact nature allows for easy storage in a closet when not in use. Closely related to the compact design, is how portable a kayak sail is. This means you can easily transport it almost anywhere. No need to worry about how you’ll fit it into your small car. The design of most kayaks allows for easy manoeuvrability. As a result, you can easily adjust the kayak sail to suit your kayaking needs at any given time. You’ll appreciate how easy it is to set up a kayak sail. Installation is likely to take you anything between 1 and 10 minutes depending on the size of the sail. Dreading the intense sun rays as you paddle? Your kayaking experience is further made pleasant because the unit is designed to provide you with shade. Also, the sail will protect you from undesirable weather elements like rain. So pick a kayak sail and certain weather elements won’t stop you from embarking on your favorite water adventure. Now, let’s discuss the best ones you should pick from. Here we have a versatile kayak sail designed to help you venture in both nearby lakes or high latitude areas. This sail features a flatter profile compared to the older model from this range. As a result you’ll enjoy more power—particularly in light wind conditions. The same design also allows for a more stable sail. 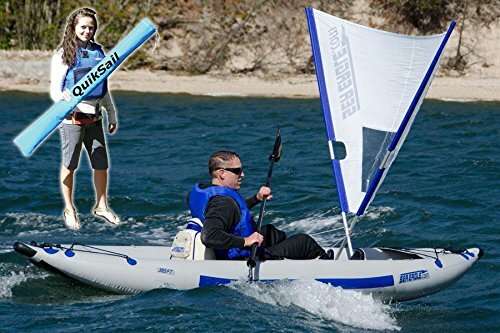 You can use this sail on almost any kayak or canoe but it’s specifically designed for the professional sea kayaker. This WindPaddle sail is made up of rip-stop nylon which is pretty durable. The seams are triple stitched and made using heavy duty composite material & that also contributes towards durability of the sail. However there’s a huge learning curve with this sail. You’ll need time to figure out how it works. But overall it works well. Why not kayak in style with this bright and colorful sail? The attractive colors on this sail are what first caught our attention with this kit. The fins on this Mirage kayak sail are designed to provide you with lateral resistance. So you don’t have to worry about going off course if you pick this unit. The sail has a two piece mast which features a diagonal batten that allows you to easily roll it up and stow. You’ll appreciate how the manufacturer included a bag for convenient storage so you don’t have to make an additional purchase. 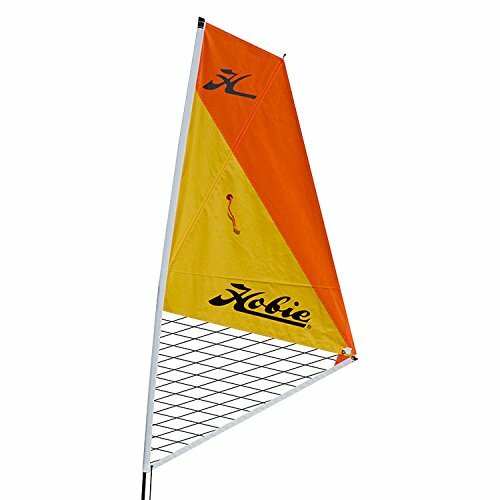 But note that this Hobie kayak sail doesn’t work with Hobie inflatable kayaks—or any inflatable kayaks for that matter. If you’re a fan of speed, then you’ll like how fast your kayak will move with this sail. Overall, this is a high quality kayak worth considering. You’ll be impressed by the large window that allows for clear visibility. Looking for a high quality kayak sail? You’ll like this well crafted sail made up of strong polyester taffeta. Like the WindPaddle sail, this unit is also triple stitched and is made up of unbreakable composite material. By picking this model, it’s safe to say you’ll have a durable sail that may last for years. 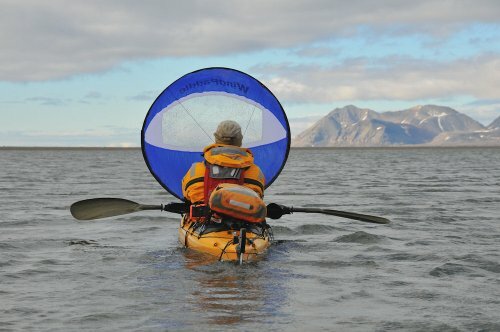 The wind paddle is specifically designed for kayaks. We’re impressed by the compact design which allows for easy setup so that you can focus on the activity for the day. This sail allows for a hassle free kayaking adventure. All you need to do is hold the clips and the kayak will move forward. And simply lay it down when you want it to stop. 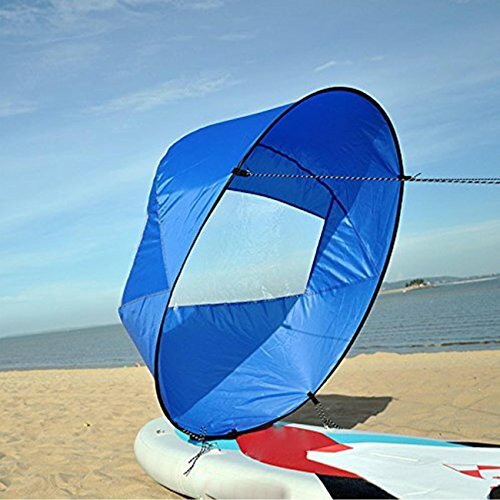 With a diameter of 108cm, you can tell that it’s a very large sail, so you’ll be protected from the UV rays as you kayak. After your adventure, storing the unit is very quick and simple thanks to its 39cm folding design. Though it features a large window, most users have reported that it has a few wrinkles. This greatly gets in the way of visibility. If you’re willing to pay a bit more for a sail you can opt for this Sea Eagle kayak which is designed to convert any kayak into a smooth sailing vessel. It’s very easy to deploy. You can complete the deployment task in under one minute. You’ll also appreciate how easy it is to store in either the bow or stern because the sail breaks down to 43”. This is the kayak to pick if you want to go downward sailing. And you can steer it by using your paddle as a rudder. Not only does it work with Sea Eagle kayaks, but it’s also compatible with most kayaks from other brands. It sails well—even on long boats. But unfortunately the manufacturer didn’t include any hooks for installation. Here is yet another sail that’s not only compact but fast & easy to deploy. Because of its curved frame, you can mount it to the deck of almost any kayak. Aside from being compact, this sail is very easy to use. It won’t take you much time to figure out how it works. Something you’ll appreciate if your sailing technique isn’t advanced. 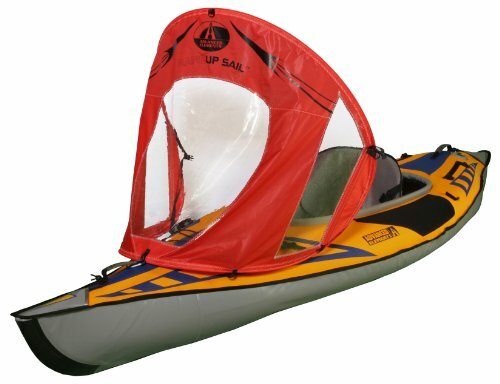 This kayak sail is very lightweight so it’ll glide on the waters with ease. You’ll appreciate how easy it is to set up. The unit folds down into an 18” disk for convenient storage, although the folding process isn’t the easiest of tasks. The small size makes it very portable so you can carry it anywhere hassle free. The sail is made up of high quality material. The durable rip stop sail cloth is designed to prolong the product’s lifespan. What sets it apart from the rest is that unlike the other models that have one window, this sail has three. As a result you’re guaranteed clear visibility for added safety. These kayak sails are available in a variety of shapes and sizes. You’re bound to find one that meets your needs and preferences. Circular shaped kayaks are by far the most common type preferred by most kayakers. Maybe the fact that they’re very easy to use makes them popular. These kayaks are hoisted either at the bow or center of the kayak. 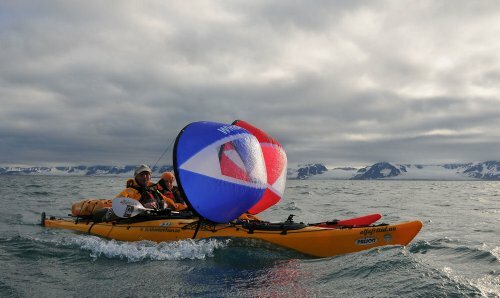 But note that this setup limits mobility which means circular kayak sails can only be used downwind. The circular shape makes the sail both easy to collapse and set up. Also, this type of kayak is very easy to store and transport. V-shaped kayak sails are ideally suited for larger kayaks. This is because when used on a small kayak, the large V-shaped design will make it easy for the kayak to tip over. It’s best for traveling downwind and is normally designed to move in one direction. 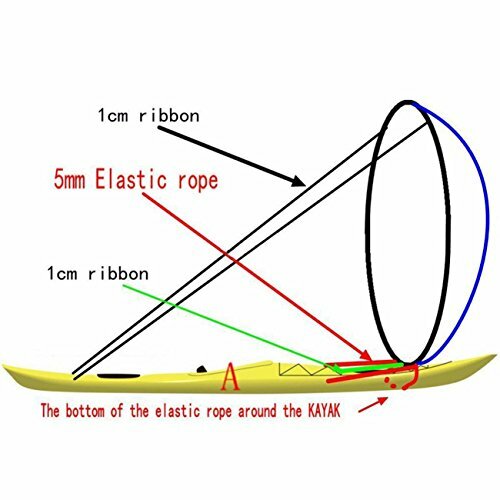 L-shaped sail kayaks—also known as free-standing sails—are the most technical of all the types where operation is concerned. This type closely resembles the real sail found on a sailing boat. The L-shaped kayak sail is designed to be mounted on a centrally fitted mast. And one of the advantages associated with this type is that it can be used in windy conditions. But we’ll have to warn you that you must possess some basic sailing technique knowledge to operate this sail optimally. Plastic: Most modern kayaks are made up of plastic. But note that these plastics are durable and flexible. As such, these sails are not only lightweight, but will last you a long time. If you do pick a plastic sail, you must ensure that you always clean it—especially if you use the sail at sea. This will remove any salt or chemicals that are likely to cause premature damage. Carbon Fiber & Aluminum: Most L-shaped kayak sails are made up of either carbon fiber or aluminum. This makes them lightweight but durable. Laminated Cloth: Most old kayak sail models are made using laminated cloth. This material is much stronger than plastic. The only drawback with this type is it’s rather heavy and thick meaning sailing will be difficult. Also, you’re likely to experience hassles during set up and storage. Always ensure that you install the sail correctly onto the kayak. Pay attention to exactly where it must be positioned. It’s a good idea to practice steering with your kayak before heading out on your water adventure. This way you’re familiar with the different techniques especially in windy conditions. Avoid sailing in extremely windy conditions as you might be dragged off course. So be sure to check the weather forecast beforehand. Are you now ready for a hassle free kayaking adventure? Pick any one from our list of kayak sail recommendations and you’ll be gliding through the water with little to no effort. Have more fun on the water than you ever had before.